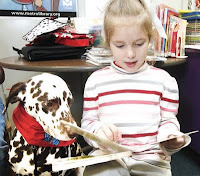 A US non-profit organization Intermountain Therapy Animals launched the first comprehensive literacy program The Reading Education Assistance Dogs® [R.E.A.D.] Program in 1999. Reading to dog programs improves children’s reading and communication skills by employing a powerful method: reading to a dog, but not just any dog. READ programs utilise registered therapy dogs that have been trained and tested for health, safety, appropriate skills and temperament. When these special animals come to hear children read - it’s fun! And that makes all the difference. All kinds of dogs can be successful therapy dogs for children.